Fire warden / fire marshal training and duties within a company can vary massively all over the country so we have put together a blog post to help you work out how to get it right in your company. 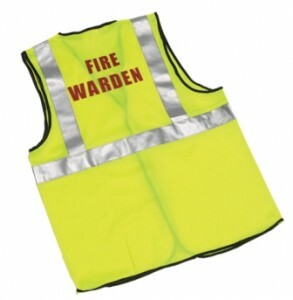 Fire warden and marshal training should really be built up from the day to day duties they are expected to carry out within your company. if you want further information please contact us on 0141 561 2735. Maintaining good housekeeping and hazard spotting. Carrying out checks that maintainance and testing happen. In the event of an alarm or a fire to keep staff safe. Rubbish management, keeping combustible rubbish away from heat sources, flammable liquids are managed correctly, windows are kept closed when not in use, looking for signs of arson or willfull fire raising are happening, storage in escape routes doesn’t happen and that fire doors are kept shut. This is not an exhaustive list and prospective fire wardens should go on appropriate training courses regularly. Daily:- clear escape routes, fire exits unlocked and can open fully, safety signs are visible, escape lights work correctly, fire alarm panels are functioning, fire extinguishers are in place and clearly marked. Weekly:- Fire doors function correctly, fire doors are visually inspected, fire alarm is tested. Periodic checks:- fire drills are carried out, assistance is available to evacuate disabled people, any changes in working practices are reported to the responsible person. All checks must be recorded and logged and reported to the company safety manager. Fire wardens play a critical role in ensuring that the evacuation procedure is followed correctly. Encourage staff and visitors to evacuate the area promptly and make sure anyone with a disability is assisted. Make a quick but thorough check that their area is clear of people by checking areas like walk in cupboards, toilets and offices. Ensure heat generating equipment is turned off. Close windows and doors time permitting. When at the ground floor report your area is clear. Go to the assembly point with staff lists in order to take a roll call. If applicable report your information to the fire safety manager and the fire and rescue service. Ensure no one re enters the building. Please note: Some fire wardens and fire marshals are encouraged to fight fires with fire extinguishers if they are small and in the early stages. That is only acceptable after they have had sufficient training on a fire warden training course and a structure and company policy is in place for safety and safe management. This is a brief outline of fire warden / marshal duties and what they will expect to happen on a fire warden training course and course content varies from course to course. The real benefit is putting all training into action by planning and maintaining a strategic and operational plan that is communicated throughout your company. This entry was posted in Fire Training / Warden Courses and tagged fire warden fire marshal duties course glasgow scotland training. Bookmark the permalink.